The shower is active throughout April and November. When it peaks, according to NASA, observers can expect about 30-60 meteors per hour. Generally the peak is spread out over about a week centered on May 7, according to the American Meteor Society. Check our Eta Aquarids Guide for specifics of how to view this year's shower. 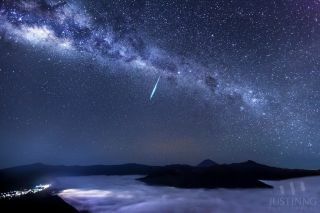 Eta Aquarids are best visible in the hours before dawn and, due to the southern area of the sky in which the radiant appears, are more readily visible from the tropical and southern hemisphere regions. While the Eta Aquarid meteor shower has been going on for centuries, it wasn't officially classified by astronomers until the late 1800s. American astronomer Hubert Anson Newton studied records of older showers, and among his findings discovered a series that took place around April 28-30. His research indicated accounts of that shower occurring in the years 401, 839, 927, 934 and 1009, according to astronomer Gary Kronk. The shower's discovery took place in 1870, based on a report by G.L. Tupman, who was reportedly a member of the Italian Meteoric Association, and was confirmed the following year. In 1876, British astronomer Alexander Stewart Herschel then noticed a link between the shower and a comet, Kronk added. "He conducted a mathematical survey to find which comets were most apt to produce meteor showers," Kronk wrote. "Comet Halley was found to be closest to Earth on May 4, at which time the radiant was in Aquarius. Herschel immediately noted that Tupman's observed radiants of 1870 and 1871 were very near these predictions." While Northern Hemisphere observers may get mixed results with the shower, those south of the equator report a much better show. Australians, for example, consider the shower one of the best shows of the year, said Space.com skywatching columnist Joe Rao. The meteors do not actually originate near Aquarius; the placement of the radiant there is an orbital coincidence. In reality, Earth runs into a stream of litter left behind by Comet Halley, which is the most famous periodic comet. Reports of Halley's Comet date back to at least 273 B.C., according to NASA's Jet Propulsion Laboratory. It also arrived in 43 B.C., one year after Julius Caesar was assassinated in Rome. The comet is featured in the Bayeux Tapestry, a chronicle of the Norman conquest of England in 1066. The comet was first pegged as a periodic one — a comet that visits the inner solar system again and again — in 1705. Astronomer Edmond Halley's calculations showed that three comets sighted in 1531, 1607 and 1682 followed very similar trajectories. He predicted the comet would come again in 1759. Halley did not live to see the comet's reappearance, but it came on schedule as he had predicted.